The background image of the Building New Lives exhibit is a photograph taken in 1950 at Pier 21 in Halifax, Nova Scotia. 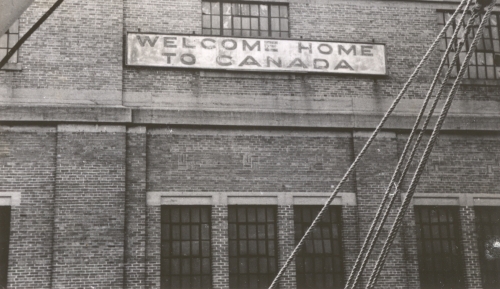 This “Welcome Home” sign was the first view for newcomers to Canada. After the Holocaust, Canada became home to over 35,000 Jewish refugees. What challenges did survivors face when they arrived? Where in Canada did they settle, and who helped them find a new home, work and education? Learn about this unique history through a collection of video testimonies recorded by archives and Holocaust education organisations throughout the country. Through personal accounts, itineraries, and photographs, explore key dates of immigration, before, during and after the Second World War. Learn also about the life stories and contributions of Holocaust survivors who made their homes in communities across Canada.